Whew… okay. Here we go. The moment we’ve all been waiting for! First off, before I dive full force into all this, I really just want to take a moment to say thank you. Over the past few years, let alone the past couple months, the amount of love and support that we have received from SO MANY incredible people is truly remarkable. We thank all of you from the bottoms of our hearts, we couldn’t be where we are today without each and every one of you. From Friends, Family, Industry Peers, City Officials, Our amazeballs Staff, Our Community and of course our die-hard Food Truck Groupies we are so lucky to have this many badass people with such big hearts so close to us. Holy cow guys… talk about a rollercoaster of excitement and emotions! Matt & I have been dreaming of the day that we could publicly make this announcement since September. We’re finally here, today is the day! 2.) Parking will be extremely limited, especially being the weekend - we highly recommend street & surrounding lot parking or utilizing ride share options! 3.) We will also be open on St. Patricks Day - Sunday March 17th - times to be announced. We will NOT have the Legion’s Hall for St. Pats, and will only be taking online & walk in orders for pick-up only. 4.) Pick-Up Orders - You can utilize our online ordering system for pick up orders starting on March 17th! Our Entrance is around the back of the building & through the brown doors! Pick-Up orders can be placed online or in person, we won’t be taking orders over the phone! 5.) Delivery - We will be slowly rolling out delivery options one by one after our opening weekend! We intend to utilize Ubereats, Grubhub & Doordash. Bear with us as we work the kinks out associated with opening a (nontraditional) restaurant location! Stay tuned for more info, we will definitely continue to post updates on new happenings! 7.) Normal Ghost Business Hours: After opening weekend, starting on March 19th - our normal hours of operation will be the following. Hours of operation are subject to change depending on demand, but we will always keep everyone in the loop with any changes that may need to be made! 8.) Please do try to RSVP via Facebook Event Page once posted - if you have FB! That way we can gather semi accurate numbers and be as prepared as possible to accommodate everyone. 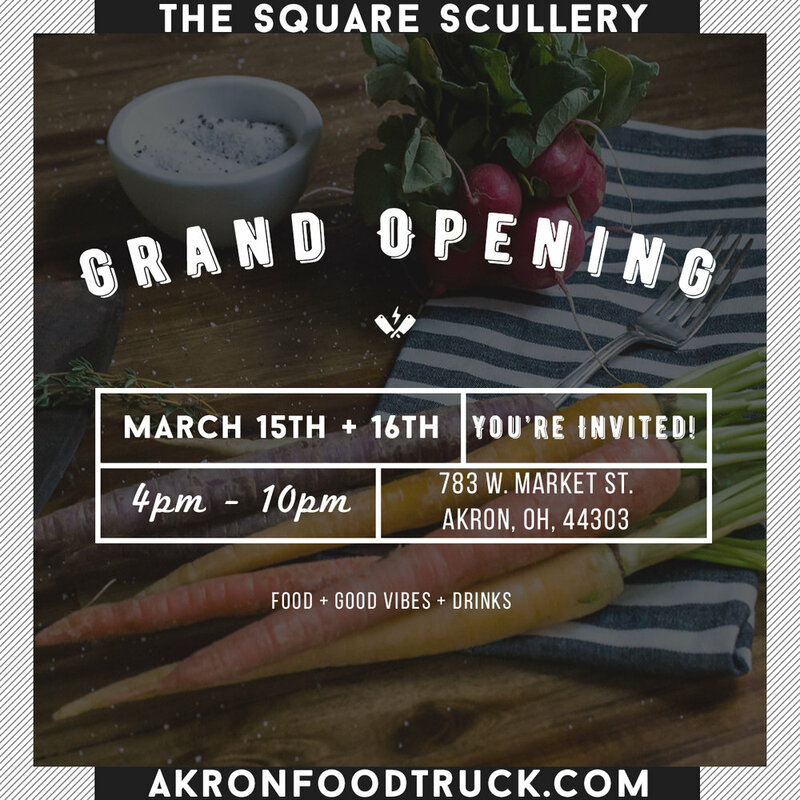 In addition to all of this awesome-sauce news, we are also super stoked to have added a few new faces to the Square Scullery family! Welcome aboard guys, we are so thrilled to have you! Stay tuned everyone, we will continue to post updates over the next couple weeks! In the meantime get excited (and hungry)! Oh!! Here is a new write up link from Cleveland.com too! catch up on happenings from the past couple months - Check out our previous blog posts!